If you have not already seen them all 5 shorts from The Parallel Lines project are now available to watch online. 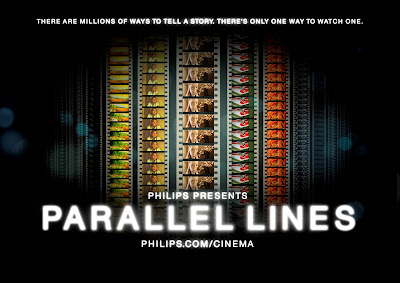 Parallel Lines is the outcome of a experimental cinematic collaboration between Philips and renowned film producers, Ridley Scott Associates (RSA), founded by legendary director Sir Ridley Scott. “There are millions of ways to tell a story. There’s only one way to watch one” – this is the creative seed which inspired a beautifully diverse yet thematically linked quintet of short films released today – the ground-breaking Parallel Lines. Johnny Hardstaff expertly generates intrigue through his development of mood and tension. Namely with the use of the operative’s own hushed voice to provoke a sense of seediness and setting of the tone. As the audience is led deeper we find a fiendish pleasure in this voyeuristic approach. Darkroom proves a clever and absorbing short that packs a very original sting in its tail. In this sci-fi thriller, Podarok introduces us to a dystopian future. It’s a winter’s day in Moscow, but the familiar landscape is not all it seems. The traditional backdrop is balanced by the technological hints to the future on show. An experienced KGB Agent is on his way to deliver a special gift. Expressionless and giving the aura of emptiness the lone man makes his way across the city. As the secret of the gift is unveiled to the receiver, the desire for the object becomes evident. The agent must have it. Even at the cost of a man’s life. A high octane chase through Moscow ensues as the dead man’s robotic butler tries to rescue the precious gift. It must not be left in the wrong hands. In this heart-warming tale set amid the tower block of a South American housing estate, a boy shows a young girl to a room with a secret. The girl is introduced to a donkey which the boy tells her is a unicorn. Delight and fulfilment fills the young girl as she is left to feel the magic of this moment in a life that has offered her so little. This joy is short lived as we are shown the difficulties of growing up as bullies taunt the pair. The boy stands up for his younger friend. Afterwards though, it all seems too much as the brave boy is left to cry quietly in the corner. Unawares to her friend’s pain the girl returns her attention to the beauty of the animal. Through animation Hi-Sim transports us into the playful imagination of siblings Jun and Aco. We are instantly rushed from the children’s attic into space as a cardboard box transforms into a spaceship. This fantasy adventure excites as our heroes find themselves in the midst of a space battle resulting in the capture of Aco. Jun is left to fall from the skies before being saved by a fire breathing dragon. Jun and his new friend blow away the enemy as the plight to save the captive Aco gathers pace. Hi-Sim manages to bring out a childlike excitement and curiosity from the moment we enter the attic. This beautifully crafted animation bursts with fantastic colours of an imagined world. Visual details have been carefully considered and realism breaks through from the quality of the effects. This is a polished short that is sure to please the whole family.